We have had several requests for details on the construction of the pullup bars we use at CrossFit Flagstaff, so here it is. Please email me, via Lisa, at lisa@crossfitflagstaff, if you have questions. I (Mike) designed and built all the pullup bars. 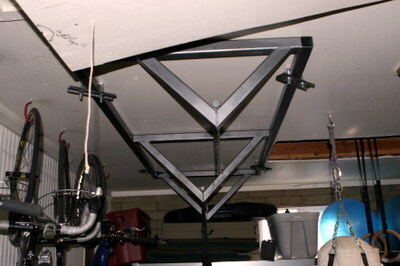 I am a novice welder; in fact, the first set of pullup bars we use at the gym, plus the ones I have in the garage at home, are among the first welding projects I have ever done. They are not always the prettiest, but they are above all SOLID, so if you are thinking of doing this yourself with limited experience, I think it is very doable. The gym has two generations of bars, and I will describe in detail only the second generation. The bar design I have used requires a strong vertical surface for mounting. The walls at our gym are cinder block and the bar frames are bolted to ½” threaded rod that goes all the way through the wall to metal plates on the back side. Our bars are 33 feet long. I made five frames and spaced them eight feet apart, letting the bars stick over the ends by six inches. This spacing interval seems to work well, at least with the solid rod I used for the bars. You can fit three people in each eight foot section. At the Cert we had twelve guys jump up simultaneously (three per eight-foot section) and start kipping like mad for the Cindy workout and you could see just a little flex in the bar and no movement at all in the frames. 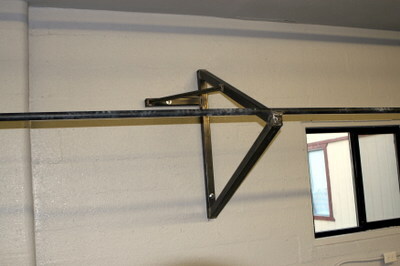 The long vertical members that bolt to the wall are 40" long, the upper angled frame member is 39" long, and the lower angled member is 42" long. 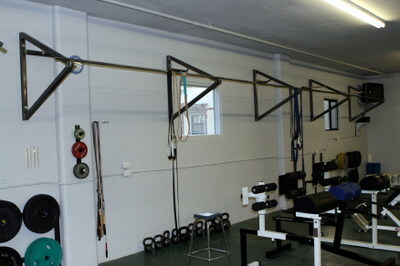 This leads to the pullup bar being about 36" from the wall, which seems to leave plenty of room for kipping. 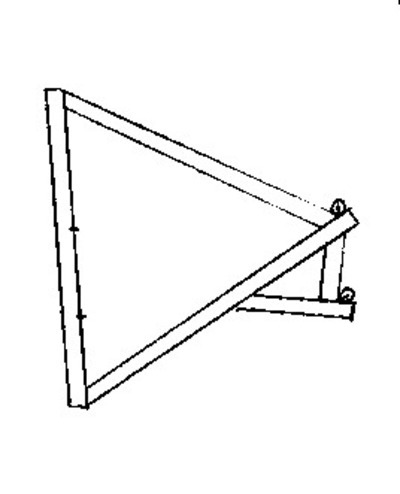 The stabilizer that goes out to the side is 15" long, and the smaller angled brace that goes to the frame is 20" long. The main frames are 1/8” x 2” square tube. The angled braces are 1/8” x 1” square tube. 1 ¼” hot-rolled solid rod. The hot-rolled is considerable less expensive than the cold-rolled. The finish on the hot-rolled is a little rougher than on the cold, but not so much as to be a problem. I chose the 1” and 1 1/8” diameters because those correspond closely to the diameter of the 15kg and 20kg (“women’s” and “men’s”) Olympic barbells. The 1 1/8” diameter was available to me only in cold-rolled rod. I added some 1 ¼” to the second set of bars because I wanted something a little bigger. Some day I will put up a 2” or bigger bar for variety. I would definitely go with tube or pipe for this. I believe that at CrossFit North Santa Cruz, they used fire sprinkler pipe for all their bars, which seemed to work well. I would look into that if I was doing it again. 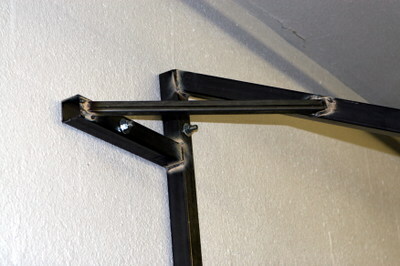 The frames were welded up at home, and then bolted to the wall. The bars were then welded onto the frames in situ, making the thing one monolithic structure. One big advantage to the new design is that the individual frames are fairly light and manageable. 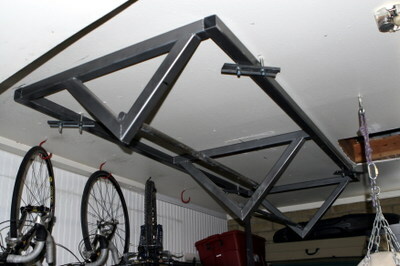 For the first pullup bars, I had to mount a bolt above the middle of each big frame, then hang a pulley system to maneuver them into place for mounting. Another thing I might change is to make some of the structure bolt together, so that if we ever need to move it, I don't have to cut and re-weld. Drill the mounting holes in the frame members before assembling the frames. Once the frames are together, the struts interfere with drilling. Make the mounting holes slightly larger than the bolts you plan to hang the bars with to allow for some imprecision in drilling. The exact frame dimensions are not as important as that they are all the same. I cut all my frame pieces to length, then laid the big triangle part of one frame out on a flat surface and welded it together. 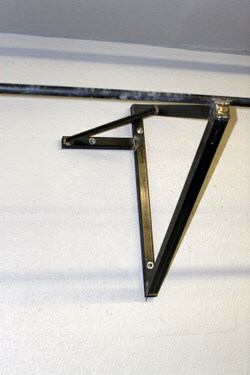 Note that the bottom angled frame member sticks out ½” past the top piece to make a notch for the pullup bar to rest on. Then I laid out another frame and put the first one on top of it to make sure the notch for the pullup bar would end up in the same place. Once the triangles were together, I stood one up on the back (wall) side, made sure it was square, and welded on the side piece, making sure that my 1” square tube braces would reach. I closed off the open end of the bottom frame with some 1/8” x 2” flat steel. Mount the frames on the wall, obviously keeping them at the same height. We hung them so the bar would be eight feet off the deck. Weld the pullup bars in place. Grind smooth all edges near the pullup bar. 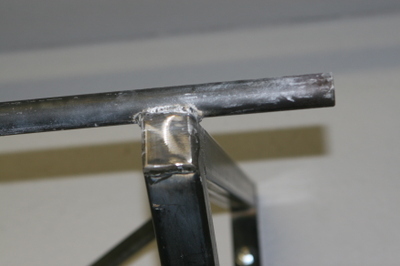 The bars themselves can be smoothed with some sandpaper to reduce the roughness a little. 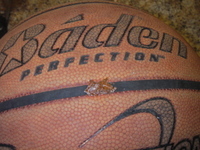 Check the basketball for leaks, especially if purchased used from garage sale or Goodwill. Then, insert an inflation pin into the ball valve. This will allow airflow out of the ball when you pour the sand in. 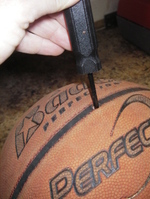 Puncture the ball with the rasp/spike from the radial tire repair kit. Stab the ball all the way through, and then rasp in and out a couple of times. You'll want your hole somewhat near the valve so it stays clear of sand as you're filling-maybe in the next black line over from the valve. Your hole shouldn't be too large, as you are creating a weak spot in your ball. Just large enough for the tip of your small funnel or syringe to fit into. I would cut your small funnel or syringe tip at an angle to make it easier to push into the hole. A flat or blunt end may create an even larger hole. 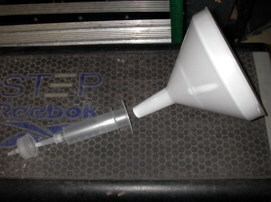 Insert smallest tip into hole, then thread large mouthed funnel into the smaller funnel/syringe. The large-mouthed funnel allows you to pour in a larger portion of sand and leave it to sift into the ball for awhile, without having to monitor it so closely. 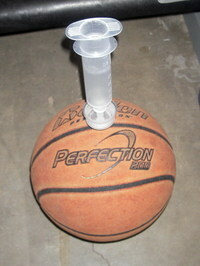 Fill large funnel with silica sand and ensure it is flowing into the ball through your filling system. 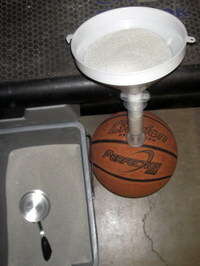 Keep re-filling large funnel with sand into the ball and weigh occasionally until ball is filled to desired weight. 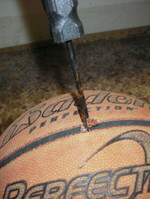 Push a piece of the sticky brown radial tire repair string into the hole with the inserting needle. 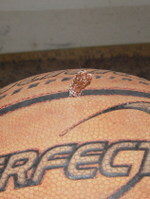 Push the needle all the way through then pull it back out until a small tip of the string is sticking out of the ball. Pull the sticky string off the insertion needle and press the revealed tip of string around the hole to ensure it fills and covers the hole completely. Remove inflation pin from ball valve. 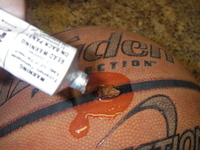 Squeeze out some rubber cement, leaving a shallow pool of it around the plug, and just a light shmear on the surface of the ball in a diameter slightly larger than that of the radial patch. Allow the cement to dry completely. Apply radial patch to dried cement over the plug, pressing firmly and ensuring all air bubbles are out and edges are well secured to ball surface. 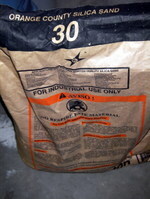 Allow patch and cement to cure for 24 hrs. before use. Air up the ball if needed in order to keep the ball round. 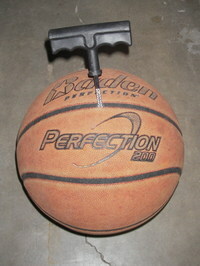 If too much air has to be applied, the ball will bounce too much, making the slam ball too easy to use properly. 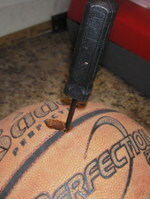 I don't recommend making a slam ball less than 15 lb. 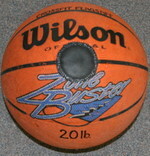 if using a regular sized basketball. Get smaller balls for less weight. I haven't heard of anyone making a heavier ball than 22 lb. with a regular sized basketball. *side note: I used Shoe Goo on previously constructed balls, as instructed by other CrossFitter's, but found that with use the Shoe Goo eventually peeled off and away from the hole. So far, the radial patches have worked better. 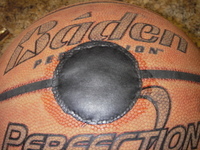 They seem to be more pliable and the edges secure to the surface of the ball better. That's my personal experience. Please give me feedback on our comments section of this blog. Updates and other's experience with this construction are welcome and appreciated! We have taken two approaches to ropes that aren't spliced in the end. One is to tie a secure overhand knot in the end of the rope with at least a twelve inch tail (so there is no way it can pull through) and then using some webbing to make a Prusik hitch under the big knot, then hang the webbing in some appropriate way. The second approach, putting the rope over a smooth round steel pipe, was to loop the rope over the pipe and then tie it back on itself with a fisherman's bend, again with a long tail. Alternatively, you could get someone who really knows how to splice to make a loop in the end of the rope for you. 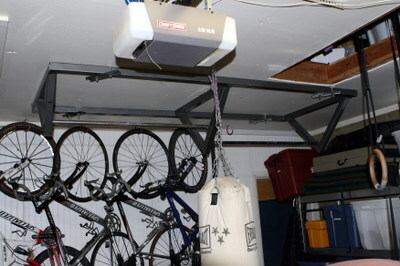 If you use the approach of wrapping some heavy chain around a support beam above and using maybe a d-ring or climbing caribeaner to connect it, get a steel carabiner to attach to the chain, or much more cheaply, a steel threaded quick link. Using an aluminum climbing 'biner on steel chain could result in rapid wear of the 'biner and subsequent failure. Be really aware of wear points in whatever system you use. I recommend always having a backup connection system so that if the primary system fails, a second system with a little slack in it (like another piece of webbing or whatever), comes tight and catches the rope before it drops someone, but gives enough of a jerk to get everyone's attention so the system gets inspected. Either way, I would be sure to check whatever system you use on a regular basis - this is life support, after all. There was a thread on the main site a few years ago about failure of a commercial system with a clamp on the end of the rope, after some prolonged period of use, and I know of gyms that have had failures of gymnastic ring systems as well. I am sure this can be done in a proper manner that is highly resistant to wear. I would just make myself very comfortable that it is a good system before I trusted it. Here's an idea. Instead of wasting a ton of tape every workout, maybe invest in some wrist straps that can be re-used. Environmentally friendly, more supportive than flexible tape, and I don't have to pay for them over and over, nor do I have to clean them up. They'll just be put in the lost and found every time they're found lying around the gym. To see how other CF athletes are using these, watch these 2 videos. I know Matt Chan was able to get through the Games with them, after seriously injuring his wrists 3 weeks prior to the Games. It allowed him to compete and take 4th place, doing Cleans and Handstand Pushups, on severely sprained wrists. Matt wore the heavy EliteFTS wraps. They also sell a more normal stiffness. Chris has the Inzer Iron Wrist Wraps on. In the mean time, STRETCH and become more flexible so you can support your wrists through your mid-line and long bones and proper rack positions! Run a strip of duct tape down the length of PVC. 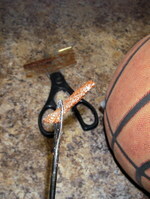 Cut down each side of the tape with a skillsaw removing approximately a 2'' strip out of the length of pipe. Cut the pipe into 3'' cross-sections and attach them to the 1x4 appropriately spaced. Attach one board at the top and one at the bottom, and that's it! 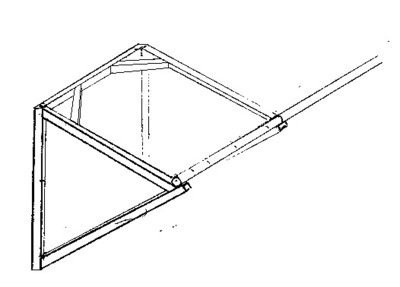 Depending on the type of material of the wall you are attaching to, anchoring systems may vary. All the braces are made of 2''x2'' by .065 square tubing. The bars going up are 11/8 cold rolled solid bar. They are spaced 20" apart. The angles can by tweaked to your liking.